Access a PDF for printing here. It’s no secret that the Canadian economy is strongly dependent on ‘natural resource’ exploitation. The transportation infrastructure this economy relies on to get these resources to market, and give them value, is virtually indefensible and its bottlenecks are often close to indigenous communities – which as we will see, is making counter-insurgents panic. Unfortunately, anarchists have rarely engaged with the potential for action and solidarity that this situation of dependency and vulnerability opens up. As Canada accelerates ecological destruction, and as global warming makes the northern latitudes of Turtle Island of greater strategic and economic value to governments, conflicts between the Canadian government and indigenous people defending the territory will become even more frequent. Anarchists should be prepared to contribute to these moments in a meaningful and effective way, beyond the limited symbolism of actions like banner drops and breaking windows, which have little impact on their targets. The technical skills required to block pipelines and rail are not great, but they still require more development and foresight than putting a rock through glass [see Appendix 6 – Techniques for sabotaging capitalist infrastructure and extractive industries]. 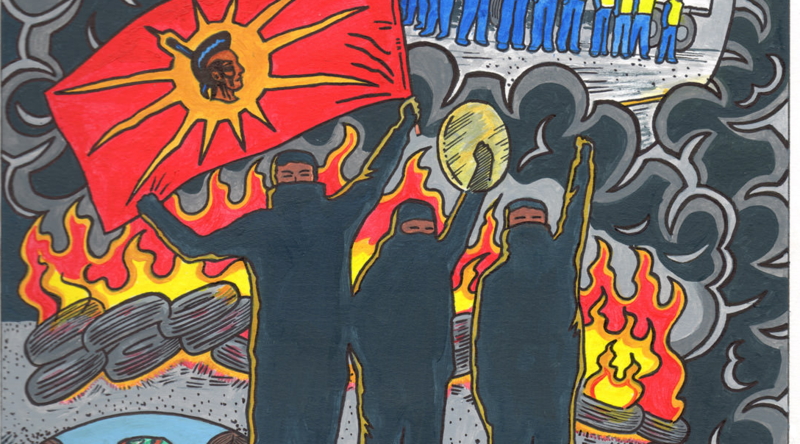 Being able to step up our solidarity requires developing practices of sabotage in the present, as well as relationships of struggle between anarchists and indigenous communities engaging in land defense. Such relationships will be essential to moving past the largely limited solidarity expressed through communiques, as well as gauging how different forms of solidarity will be received by different, heterogenous communities in struggle. In 1990 during the Oka Crisis, when a capitalist development on a Mohawk burial ground created an armed conflict with the Canadian government, sabotage of hydro-electric towers and hard blockades of highways and railways spread like wildfire. This threat of indigenous insurgency is a primary consideration in police operations against any indigenous action, because the government has seen how such sparks can ignite a powderkeg if they don’t tread carefully, particularly when they involve land or treaty claims. During a land defense occupation at Caledonia in 2006, the Commissioner of the OPP explained that he acted on the premise that a misstep on the part of his officers against the occupation would have led to “[a native] flare-up right across the country”, so to deter this greater threat the OPP took no direct action against it [for more on how counter-insurgency strategy has developed since Oka, see From Oka to Caledonia: Assessing the Learning Curve in Intergovernmental Cooperation]. 2) Warrior Cohort – young and middle aged men who are likely to become warriors. Bland completely overlooks the ways women and two-spirit people contribute to indigenous resistance. The government tries to reduce this populations ‘recruitement’ into resistance movements through education and training programs aimed at assimilation. 4,5) Commodity Exports & Topography – “Jurisdiction control of the land remains largely undetermined and at issue. Canada’s transportation and energy infrastructure – the backbone of the country’s resource trade – overlays or borders on many of these Aboriginal and disputed lands. With Canadian natural resource development, extraction, and trade representing 25 percent of Canadian GDP, the security of transportation and energy infrastructure is critical. Canada’s transportation and energy infrastructure has considerable vulnerabilities: it covers vast distances, has limited redundancy and multiple choke-points, and is susceptible to cascading effects should disruptions be sustained or widespread. Its vulnerability and resulting risk to the Canadian economy is significant, and sustained disruption would have catastrophic effects with a matter of weeks.” Topography and reliance on exports are the two determinants that are impossible to change. In fact, Canada is slated to become more dependent on its export economy in the coming years. The appendixes that follow take a look at how extractive infrastructure is vulnerable in more detail. We hope they prove valuable to affinity groups and communities fighting the extractive economy across the territory. Heavy truck transportation is responsible for a large portion of Canada’s GDP and is especially prevalent in the Southern Ontario – Quebec corridor. A key vulnerability in this export/import network is the concentration of its critical transportation lifelines in a relatively close area funnelled through six congested gateways mostly in eastern Canada. For example, 75 percent (by value) of Canada-United States trade is carried by trucks through six border crossings: Windsor/Ambassador Bridge, Fort Erie/Niagara Falls, and Sarnia, Ontario. The remainder passes through Lacolle, Quebec; Emerson, Manitoba; and the Pacific Highway in British Columbia. See Appendix 2 for bottlenecks by province, Appendix 7 for the 20 Worst Traffic Bottlenecks in Canada, and Appendix 6 for several techniques for blocking road infrastructure. Railway is the heart of Canada’s transportation infrastructure. It’s the third largest system in the world: 2,900 locomotives and 10,000 employees. Most important railway commodities: coal, iron, potash, fuel oil, crude petroleum. These types of bulk cargoes can only be transported by rail. Three national railways – VIA, Canadian Pacific, Canadian National – move 70% of freight. Much of this traffic flows from Canada into the United States, but a large percent of it also moves east and west on two main lines over Lake Superior and through the Winnipeg bottleneck. Every route, including those in the Montreal-Windsor corridor, is vulnerable to blockade and intentional damage. The isolated northern Ontario-Kenora-Winnipeg routes are particularly vulnerable and pass through the homelands of several large First Nations communities. A burning car on a railway track is not simply a blockade, it is also a very efficient and economical weapon. A car with a full fuel tank would burn at a temperature high enough to warp the track and require extensive repairs. An attack on isolated tracks in sparely settled countryside, for example, north of Lake Superior or west of Thunder Bay to the Manitoba border, would require the deployment by rail of special repair equipment. Once deployed, other attacks on the same line might trap that equipment in the wilderness. There is little doubt that one or two effective attacks, especially ones that derailed trains, would close CP and CN traffic simply because sensible train crews would refuse to travel on insecure railways surrounded by hostile forces. A map of the rail choke-points throughout Canada (and globally) can be found at empirelogistics.org/sci-map. Several techniques for sabotaging rail lines are in Appendix 6. The main value of the marine infrastructure to Canada, especially for the St. Lawrence Seaway, is its utility as an alternative or supporting transportation system for road and rail operations on the west-east transportation corridor. Although it would be difficult to interfere directly and effectively with terminal operations in Thunder Bay or elsewhere in the St. Lawrence Seaway system, disruptions to road and rail transportations systems leading to the ports would effectively close these vital, weather-sensitive, seasonal operations. Any prolonged stoppage of operations at Thunder Bay would produce serious disruptions along the entire Seaway system and to economic activities throughout north-western Ontario and across the prairie heartlands. An enormous 700,000 kilometre network of pipelines as well as railways, trucks and ships move crude oil and natural gas from wellheads mostly in western Canada to refineries and onward to markets in Canada, the United States and Mexico. Unlike electric energy transmission lines, crude oil and natural gas pipeline are relatively secure from harm once they are properly placed in the ground. Each pipeline, however, requires pump and compressor stations to push product through it. These above-ground stations are susceptible to damage and interference. Other supporting parts to the crude oil and natural gas system might also be vulnerable to interference and accidental damage, including crude oil refineries, natural gas processing plants and storage facilities for both products. Several techniques for sabotaging pipelines are in Appendix 6. Vast hydroelectric systems provide energy for transportation, manufacturing, agriculture, etc. Transmission infrastructure is almost impossible to protect because they travel through thousands of kilometers of rugged terrain. There are four principal hydroelectric systems of waterways, generating plants, and transmissions lines – Hydro-Québec, Hydro One (Ontario), Manitoba Hydro and BC Hydro. Transmission and distribution lines are critical infrastructure in each system. Transmission lines carry high voltage current to transformer stations. Distribution lines carry energy from these stations to consumers. As the Great Ice Storm of 1998 in eastern Ontario and west Quebec made dramatically obvious, these lines are fragile and exposed to many natural and technical threats. In circumstances where damage is widespread, recovery is difficult, expensive and slow. In 2014, a pilot used a plane to hobble two massive power lines, nearly crippling Hydro-Quebec’s power grid with one act of sabotage. The technique had been used during conflicts in Iraq, Kosovo and Serbia and was “easily accessible on the Internet” – unidentified materials were dropped on the lines from the plane at three locations on the same day. Several techniques for sabotaging Hydroelectric infrastructure are in Appendix 6. British Columbia: mountain and coastal road and rail systems; road and rail approaches to Pacific Ocean ports; crude oil and natural gas transmission pipelines, especially pumping stations, compressor stations and refineries; and all the transmission and distribution facilities of BC Hydro. Alberta: crude oil and natural gas transmission pipelines, especially pumping stations, compressor stations and refineries; and coal-carrying railway systems. Saskatchewan: crude oil and natural gas transmission pipelines, especially, pumping stations, compressor stations; railway transportation systems for natural resources; and Trans-Canada Highway intersections crossing the province. Manitoba: The most vulnerable west-east transportation hub in Canada. Any disruption of the concentrated road and railways intersections at Winnipeg would have enormous, negative economic consequences across Canada. There are no easy or cost-effective ways around this transportation hub. Elsewhere in the province the most important assets are the Manitoba Hydroelectric system from Nelson River generating facilities and the transmission lines running south and the hydroelectric distribution lines in the Winnipeg area. Ontario: the west-east road and railway transportation convergence in the Thunder Bay area; the access roads and railways into the Thunder Bay port; the junction of the Highway 17 and Highway 11 Trans-Canada Highway systems over Lake Superior at Nipigon; the international bridge at Sault Ste. Marie; the road bridge over the Petawawa River on Highway 17 at Petawawa; the road and railway bridges over the Rideau Canal system on Highway 401 and Highway 2 near Kingston; the 400-series highways in and around Toronto; the roads into the Windsor/Ambassador Bridge border crossing; and the Welland Canal operating facilities. Quebec: the Hydro Québec transmission lines from the James Bay generating facilities; the Hydro Québec distribution system in lower Quebec; the bridges near Montreal and Quebec City; the east-west-bound highways north and south of the St. Lawrence River; and the highway approaches to the United States. Atlantic Provinces: roads and railways to Quebec and the United States; road and railway approaches to Halifax harbour; and the hydroelectric transmission and distribution lines from Quebec. The Territorial North: major roads to Whitehorse and Yellowknife; airports; hydroelectric stations; pipelines; winter roads to mining camps. From warriorpublications.wordpress.com. For a broader look at similar actions in BC, “BC Native Blockades and Direct Action: From the 1980s to 2006”. By late July 1990, Indigenous barricades had been set up on seven roads and railways in British Colombia, initially just in support of the Mohawk warriors, but later mutated into a negotiating tactic in a determined effort to seek justice from the provincial government. The blockades wreaked havoc on the tourism and forestry industries of central British Colombia, halted freight train circulation in the interior of the province, and brought losses of $750,000 a day to BC Rail (People of the Pines, 281). At the peak of the crisis, the Mercier Bridge and Routes 132, 138, and 207 were all blocked creating substantial disruption to traffic. When the Kahnawake-manned barricades at the Mercier Bridge were removed, protesters at Kanehsatake knew that they had little hope of continuing the struggle without such an important negotiating item; they had lost an important resource. In northern Ontario, Anicinabe near Longlac (Long Lake) blocked the Trans-Canada Highway in early August. On August 13 they also blocked Canadian National Rail for about 1 week (costing an est. $2.6 million in lost revenue each day). This blockade was soon followed by blockades on nearby Canadian Pacific railways by the Pic Mobert and Pays Plat bands. When court injunctions were obtained by railway officials, another blockade would be set up by another band. In southern Alberta, Peigan Lonefighters began diverting the Oldman River away from a half-constructed dam. On September 7, dozens of police escorted provincial employees and heavy equipment to repair the dyke which had been breached by the Peigan. Warning shots were fired and a 33-hour standoff occurred. In the end, the widespread campaign of blockades, sabotage and occupation served to put extreme costs on attempts to evict the Mohawks from their occupation and proved to be very effective in securing their victory to protect their burial grounds and pines. During the Idle No More movement’s January 16th Day of Action, Indigenous demonstrators stopped passenger railway traffic lines between Toronto, Ottawa and Montreal. Others stalled major highways and rail lines in parts of Alberta, New Brunswick, Ontario, and Manitoba, including Portage la Prairie, which a CN Rail spokesman described as a “critical link” in its network. Demonstrators also gathered in Windsor, Ontario at the Ambassador Bridge to Michigan, shutting down traffic through North America’s busiest border crossing for trade between Canada and the U.S. with 10,000 trucks on average passing daily. The trucks were targeted because of the environmental destruction these two companies cause turning forests, creaks, rivers, and farmland into concrete and death. They were also selected to send a message to all other developers, currently encroaching on native land, your developments are the continuation of a war on native people started long ago, get out of native land everywhere. Finally, we send a message to all state forces CSIS, RCMP, OPP, and Police. Let this be a sign of days to come. When you attack natives anywhere, we will attack you everywhere! Last night, a group of settlers blockaded Highway 6 at Paisley Road in Guelph, Ontario. Our blockade consisted of a flaming barricade, construction pylons, and about 20 people. This blockade was erected to oppose and draw attention too the continued OPP siege in Tyendinaga and the continued state repression of not only indigenous communities, but all of us. We chose Highway 6 because it is the same road being blockaded by members of Six Nations, also in solidarity with Tyendinaga. These blockades are spreading and will continue to spread with growing momentum until all stolen land is returned. It only takes a few people and last night we demonstrated that. We hope this can be a model for other communities and encourage you to respond locally. As the Railway Ties Collective said in May of 2007, “Real solidarity means shouldering some of the burden of struggle.” Return all stolen land. Free all political prisoners. Abolish all hierarchies. In the morning of June 17th 2009, a few people dressed in black blocked the Hanlon Highway at Paisley Road during rush hour. This action was done to disrupt the transport of goods and people, especially those belonging to the Linamar Corporation. Linamar is a member of the Security and Prosperity Partnership, which works to improve the efficiency of North American trade. Amongst its plans is the militarization and fortification of the borders and their guards. Like in Awkesasne, Tyendinaga and Peru, we too stand against the SPP and its projects. Solidarity with the Mohawk Nation means ATTACK! – at choke points, to block the smallest pass (not the widest). For example, on a bridge or in a narrow canyon pass, or on a roadway with heavy forest on either side, etc. – so that they look down on opposing forces, not up (for example, near the top of a hill). Many Native blockades are established by simply parking vehicles across the roadway. This has the advantages of being a large barrier that is easily put in place, and which can also be quickly moved on or off the road. Disadvantages include the owner of the vehicle possibly facing charges, the vehicle itself being damaged by vigilante citizens or police, or the vehicle being seized if police overrun the blockade. Some blockades have used abandoned or wrecked vehicles to block a roadway. When Quebec police raided the Mohawk blockade at Oka/Kanesatake on July 11, 1990, warriors used several abandoned police cars to establish a hasty blockade on a nearby roadway. These vehicles were put in place by a front end loader, and the vehicles themselves were destroyed. The barricade was reinforced over time and persisted throughout much of the summer long standoff. Shortly after the raid on Kanesatake, Mohawk warriors at Kahnawake seized the Mercier Bridge, a vital commuter link into Montreal. They drove their vehicles onto the bridge and blocked the roadway. When cars began driving around them, they pulled out assault rifles and established an armed blockade, forcing cars back and down off the bridge. This hasty blockade was also reinforced over the days and weeks that followed, including the construction of sand bagged positions (protection against small arms fire). In 1993, members of the Cheam band in BC blocked a railway by parking heavy machinery on the tracks, threatening to tear the tracks up if the RCMP raided the blockade. In September 1995, following the police shooting of Dudley George at Ipperwash, Natives set up a road block using an abandoned vehicle that was set on fire. In 2000, Mi’kmaq at Burnt Church, New Brunswick, also blockaded a road using an abandoned car set on fire to prevent RCMP and/or vigilante citizens from entering the reserve-territory. Another technique often used to establish a blockade is the use of a spike board (at least in south central BC). Similar to the spike belts used by cops, a spike board consists of a piece of lumber with large spike nails hammer through one side. This is laid across the roadway, and is pulled off/on with a rope handle attached to one end. If a vehicle refuses to stop, they will drive over the spikes and puncture their tires. Spike boards were used during blockades in the south central BC region during the spring of 1995, and during a 10 day blockade of commercial vehicles on Highway 99 at the Sutikalh camp (St’at’imc territory) in 2001. Some hasty blockades have been established by cutting down trees so that they fall across the roadway, making them impassable. A military term for this technique is abatis (or abattis), with the trees felled so that they cross over top of one another. Historically, abatis were made of branches pushed into the ground with their sharpened tips pointed toward the enemy. An abatis made of trees can be dismantled fairly quickly by forestry workers equipped with chainsaws (metal wire can be added throughout at random and painted to match the bark, which stops chainsaws and wrecks blades), or by heavy trucks equipped with cables that pull the trees off the roadway. Felled trees were used during the 1995 siege at Ts’Peten (Gustafsen Lake) in south central BC (Secwepemc territory), and during the October 2013 Mi’kmaq blockade of fracking vehicles in New Brunswick. The piqueteros of Argentina, a movement of poor and unemployed people that arose in the late 1990s, developed the hasty blockade to a high level. During large mobilizations, and through coordination between many autonomous groups, they used hasty blockades to paralyse the transportation infrastructure of the entire country. In August 2001, for example, the piqueteros were able to shutdown some 300 highways and roads throughout the country. The most common tactic used by piqueteros was to arrive on a road, highway or city intersection, and block it with tires. Small fires were often built in the middle of the road, and if necessary the tires themselves were set on fire, often by inserting a few plastic bags doused with gasoline into each tire’s rim and igniting them. The burning plastic bag would quickly ignite the rubber on the tire (tire fires, it should be noted, are highly toxic and could be hazardous to residents in a densely populated area). In one case, a hasty blockade established by piqueteros consisted of the unravelling of a chain link fence and extending it across a roadway, where it was secured to a telephone pole. The piqueteros, a movement based in community and family groups, would also have a self-defence force at their blockades, usually masked people armed with batons. The batons became one of the symbols of the movement. These groups would defend the blockade against any vigilante actions by motorists as well as assaults by small numbers of police. Piquetero blockades often lasted until police had mobilized a large enough force that threatened the blockade, at which point they dispersed. From dissemination.noblogs.org. The project is for opposing the Enbridge Line 9, but many of the concepts are transferable to other pipeline projects. understanding infrastructure basics can help us pinpoint an appropriate point of resistance – so here are some basics. oil is extracted from the tarsands, and upgraded for transportation through pipelines, or refined for their final destination. pumping stations keep the product flowing through pipelines. densitometer stations send back flow rates and viscosity. bulk oil can be stored in tank farms, until it is refined further, or shipped by rail or truck. valve stations contain valves that open or close the pipeline to isolate sections/stop flow. junctions are facilities where other valves can be turned on or off to direct flow into certain facilities. facilities, pump stations, terminals, valves, and densitometer stations are all accessible via maintained roads. terminals & storage facilities are often secured 24 hours with lighting and staff on site. there is lots of aboveground structure including above ground pipelines, valves, electrical systems, flow measurement systems and large cylindrical storage tanks. there are 3 along line 9 – in sarnia, westover and montreal – but smaller delivery lines also feed offset facilities on the way, such as the petro-canada tanks in so-called missisauga. pumping stations may or may not be staffed by security at night, and are usually fenced with 6-8 foot fencing topped with barbed wire. infrastructure also exists here, including above ground pipelines, valves, PIG traps, flow measurement and emergency shutoff buttons. valves & densitometer stations are usually small & isolated, also with 6-8 foot chain link fencing & barbed wire. their enclosures have a gate entry, often secured with a standard key lock that can be cut with larger-sized bolt cutters and contain a small shack housing electrical sources and measurement equipment. valves have an additional link-chain wrapped around the hand wheel and stem, meant to prevent rotation. integrity dig sites will be accessible via private property/stakeholder driveways or the right of way. they are sometimes marked with construction truck signs and flagging. notices for future digs are posted in the maintenance filings on the neb site. right of ways are marked at road crossings by a small sign at the side of the road. It’s easy to find the closest crossing to navigate your way in to the site. Though identifiable in natural areas, ROW’s aren’t always easy to access and traverse swamps, river crossings, property lines etc. if you decide to go for a walk in these manmade mosquito breeding corridors you may have to jump some property fences to continue along your journey. enbridge has a number of valves on all of their pipelines. these valves are often located in more isolated/rural areas, accessible right off a maintained roadway, and surrounded by chain link with razor wire. locks can be cut by larger sets of bolt cutters [or chain link cut with smaller pairs]. *update: since a number of successful valve site occupations and nighttime sabotage actions, enbridge has added heavier reinforced chain link and lock boxes to their valve facility enclosures. while you can’t cut the chain anymore, or access the locks, you can cut through the chain link fence! also: scout appropriately beforehand. enbridge has acknowledge changes in security, which could mean anything from new chains to security patrols to cameras/motion cameras. BE SAFE! in their line 9 filings, enbridge claims to be intending to use a double flanged electronically actuated valve manufactured by zwick. their schematics can be found here. while it appears the majority of older manual valves have been converted to electronically actuated valves, operational/functional manual valves do still exist on the line. enbridge claims only 3 are still existing – all near or in quebec [KP 3458.31, KP 3483.12 & KP 3500], however this is not true. there is at least one other near so-called sarnia [KP 2816.37] off mandaumin road and may be more. *update: enbridge will be converting the mandaumin road valve, but have no fear – that means they will need to shut off line 9 at one point, and electronic valves have been successfully operated. 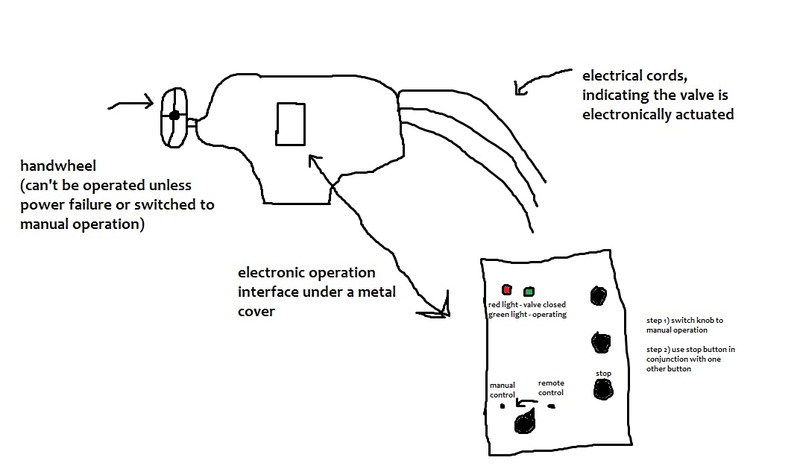 see here and this handy drawing that was submitted to the site through an anonymous email. in that email, it was also noted that different valves may have slightly different electronic interfaces. a manual valve is only operated by a manual hand wheel, while electronically actuated valves are operated by electricity – either from remotely, or on site if switched to manual operation. the manual hand wheel will not operate the valve unless the power is off or the valve is on manual/on-site operation. they’re fairly easy to tell apart – manual valves just have an encasement and hand wheel, while electric valves will have a hand wheel, encasement, electric cords attaching to the bottom with hex-bolts, and sometimes other measuring equipment. what is known is that electronic-actuated valves rely on a power source, and in so-called canada are mandated to have a backup power source to move the valve into a “closed” position during a power failure [called “fail-to-safe”]. additionally, enbridge has previously submitted that using a manual valve to turn off a pipeline can take between 10-15 minutes of rotation, so go prepared for a workout. *update: enbridge has removed the handwheels on the manual valves of line 9. you can cast the bolt size and create your own wheel, however – or find an appropriately sized tool [the bolt is bigger than you think. cast it with a pie pan and clay or something similar!]. pipeline networks are vast and hard to secure, making oil & gas company’s weakness our potential strength. the pipeline infratructure itself is above ground at three points: during layout/construction of a new pipeline/segment, during maintenance when it’s uncovered, and where it comes above ground to pumping stations and terminals. physical pipelines themselves can have varying maintenance requirements. while anomalies on pipeline surfaces are often ignored, there are rigid replacement requirements around at least two specific damages that can delay operation. ii. scratches on pipe threads of newly laid out/uninstalled pipe. clearly it’s in our best interest to let everyone know when these things may have been tampered with or damaged. some pipeline facilities including densitometre stations and valve stations have telecommunications systems to relay information on pumping pressures and pipeline content and allow remote access/control to these systems. it’s not unimaginable that any kind of interference with their telecommunications equipment might lead to a forced shutdown of the pipeline. In the late hours of 25-11-16, we carried out coordinated arson attacks against the German energy multinational RWE in the vicinity of the Hambach opencast lignite mine. For the transformers and the substation we burnt car tires filled with gasoline soaked rags. We placed these beneath exposed insulated cabling on the substation and inside the transformers. Within several minutes these targets were engulfed in flames and as we departed the substation exploded, sending arcing electricity and purple flames ten metres into the night sky. We took a risk assessment and as night just started to close in we entered the 1st railway tunnel, we cut both lines with a portable disc cutter, we didn’t imagine de-railing a locomotive but wrecking disruption and economic damage (time is money). We entered a 2nd and did a further two cuts, marking them all with pink paint, and leaving a banner as a warning. This action and actions like it are quite easy to do yourself. This only took a few hours and a little bit of planning. The hardest part was calming our nerves. Particularly easy was placing wire on the tracks to send a signal to the train company that the tracks were blocked. This action can and has been easily repeated wherever train tracks are. For more info on how to do this check out this explanatory video (see link online at warriorup.noblogs.org). We thought the party was over, but then on the way back we noticed some welcoming lights from an office trailer in a fenced compound. Next to the trailer were two parked diggers in dire need of maintainance, we checked the trailer was empty by smashing its windows, then cut the fence and set about immediately improving the air conditioning of the diggers, smashing their windows, cutting all of the hydraulics and adding some extra holes to the coolers. We also poured some dirt and broken glass in the gas tanks and used a bolt cutter to cut the valves of the trailers tires. A ‘T-mobile’ repeater was destroyed by fire. All effort was made not to endanger any life and the mast was chosen due to its distance from residential buildings and activity. The fence was cut with bolt-croppers and placed at the base of the antenna, wrapped around the electrical cables powering the mast, was a cut tyre filled with rags soaked in paraffin. Soaked rags were also tied to the cables and tucked into the tyre. Firelighters were used to ignite the lot.